Wow, this has been such a long, long week. So, let's start at the very beginning! Last Saturday I was especially tired after work. I tried to stay up and read, but by midnight my head was hurting and I was exhausted. Sleep came quick. My wonderful husband let me sleep in on Sunday, but when I woke up I had the most horrible headache. Every time I moved it got so bad it brought me to tears. I was nauseous and tired. So, I slept the day away.... I woke up around 12:30 and got up to eat. I could barely stand it and ended up right back in bed by 2. Then I slept again until 4. My husband kept saying we needed to go to the hospital... but I was reluctant. I have had migraines before, and needed pain management at the hospital, but this headache felt different. It wasn't a migraine. I kept looking online trying to see what it could be and the only thing that fit was meningitis. I assumed that couldn't be possible because I didn't have a fever and I didn't really feel "sick". Still, I figured that I probably should go get checked out since a severe headache can be so many things. Well, I got to the hospital around 4:30. The triage nurse took my vitals and my BP was sky high. This made me wonder if I as having issues with my blood pressure. It made the ER staff wonder the same thing. I get into a room and they draw some blood and get a urine sample to see what was going on. Then I get an IV eventually...and finally some morphine. Even after 4mg of morphine the headache was still bad. After about 5 hours in ER they told me I was being admitted and would be watched in OB. While I was in OB and on morphine my blood pressure was completely normal. They finally got my labs back and my liver enzymes were elevated, and apparently my reflexes (which they had been testing every 15 minutes or so) were "brisk". The doctor came in to see me. It was about 1am when the doctor came in and he explained that he thought I was having some pregnancy induced hypertension... but when he noticed that all my BP's recently were normal he said that it could just be a migraine. I explained that this was not like any migraine I've ever had before. He told me he would be in in the morning to check on me and we would go from there. Well, morning came and the doctor ran some more blood tests. My liver enzymes were up and my reflexes still brisk. The doctor said he was pretty sure that there was something going on because of those two symptoms, but he couldn't explain my normal blood pressures. He again said that it could be a migraine... and I told him again it was different. He asked how, and I proceeded to explain that every time I moved my head it hurt so bad it was almost unbearable. He told me to put my chin to my chest, and I could barely do it. It hurt so much! He then said that I may have meningitis. The doctor said that he was still concerned about preeclampsia and that the only way to cure it was to deliver the baby. I was on a lot of morphine and he said that by delivering the baby we could A) "cure" the preeclamsia, B) Use stronger meds to get rid of the migraine, and C) test for meningitis during the spinal block. So, away we went signing forms and preparing for my c-section that would be happening in about 2 hours. Well, at 11:29am our Little Luke was born. Surprisingly, this c-section was much easier than the first. My anxiety level was pretty low...maybe it was all the morphine I had gotten before? The surgery itself went well...but everyone was worried about Luke. He wasn't breathing very well. 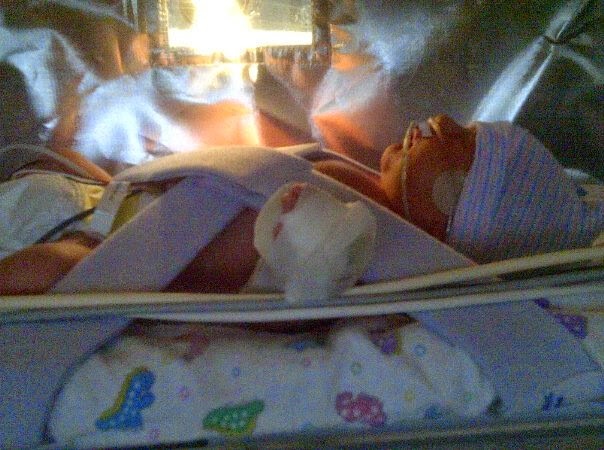 He was born at 37 weeks 1 day, so he was a little early. My husband got to carry him to the nursery, but that was the last time anyone would hold him for a few days. While I was in recovery a lot of things happened. Luke was put on oxygen and had monitors put on. He was breathing really fast and his O2 was dropping often. He stabilized some with the oxygen, but he needed to have someone watch him all the time. I was very sad when I got to my room and I was told I couldn't see my baby. My headache had magically gone away after the birth, so the doctor assumed that pre-eclampsia is what was wrong. I was so relieved that I didn't have to deal with the pain, but the medication that they were giving me for the pre-eclampsia made me hot and very, very nauseous. Later that night, around 9 or 10, the doctor came in. I hadn't been allowed to eat at all, so I was STARVING. I asked if I could eat something, and he told me no...the medication I was on would make me throw up anything I had. :/ Well, a short while later he came in again. The results of my spinal tap were back... they were positive for viral meningitis. The good news...I could get off that nasty meds and eat- the bad news... this could be bad for Luke. Luke struggled over the next 24 hours, and his pediatrician was in close contact with the NICU from a hospital south of us. Our hospital doesn't have a NICU, nor do any that are close to where I delivered. Luke was put on antivirals to help protect him from the meningitis and he had an x-ray to check his lungs. 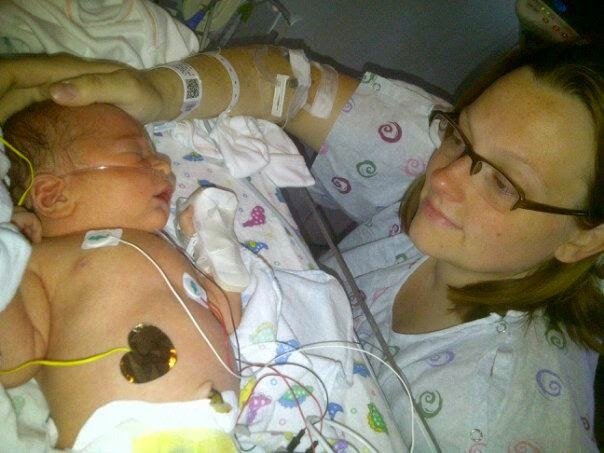 The day after Luke was born he had a second chest x-ray which revealed that he had an air leak in his lung. This meant he needed more care and had to be transferred. I was allowed to get up and go down to see him since he would be leaving and I had to stay... it was extremely emotional. All snuggled in and on his way. I had to stay, so it was so hard to stay while he left...especially knowing that I wouldn't be able to see him for at least a few days. Here's a post about Luke's progress in the NICU so far. Oh my goodness Jen! Prayers and great thoughts are being sent your guys' way!!! Here's to a speedy and.amazing recovery little man!! Poor baby Luke has been through so much!! Praying for him! This brought tears to my eyes. 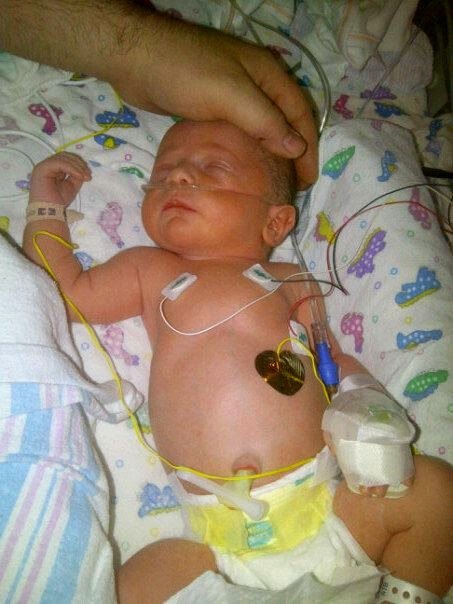 I pray baby Luke gets better and stronger. First of all - congrats! He is so very adorable. :) I can't wait for him to be home and in your arms. I'm definitely crying. I hope you get to see your baby boy soon! Praying for you and your family! Hugs and prayers sweetie. God was truly watching over the both of you. He's a beautiful boy.